He is already an All Breeds Best in Show winner and a very consistent winner in the show ring. He is not shown now due to my ever increasing commitment as a Marriage Celebrant. 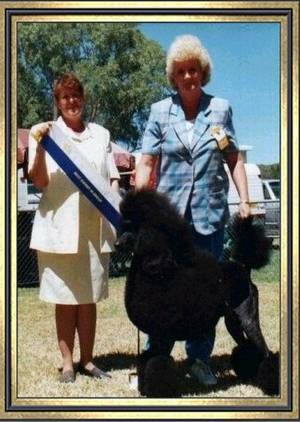 Both Harrison’s sire and grandsire are Australian Grand Champions with enviable Best in Show records. His half brother on his sire’s side, Aust Grand. Ch. Obanya Black Claude recently created history when he became a third generation Aust. Grand Champion while his half brother on his mother’s side Ch Disque Break Every Rule has excelled himself with many obedience, tracking and endurance titles. Harrison is a wonderful companion and demonstrates a very gentle nature with the toy poodles.One of his favourite playmates is the brown toy poodle "Sherzam Super Sensation "(Georgia Brown) and they can be seen chasing each other happily across the paddocks. “ Sherman” – (Aust Ch. Disque Gentleman Thief) and for their ongoing friendship and support over many years.